Before long the cast of characters of this convoluted comic caper includes an African-American Trekkie pickpocket, a wisecracking blonde out to catch herself a senator, and a drug-addled computer geek so tripped out he thinks he’s paralyzed. By the time the scam reaches its climax in a fake FBI sting suite at a raucous State Party convention, no one is sure who anyone really is or which of three (or is it four?) sides they might be on. To decide the winner, it will take seductions, betrayals, a rooftop shootout, and tuxedo-clad congressmen diving for $100 bills in a hotel swimming pool. 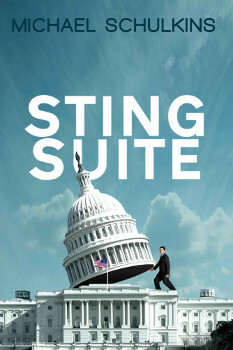 Full of wacky characters, absurd situations, wry political satire, and mind-bending cons within cons, Sting Suite is a dizzying comic romp through the corridors of power.